I’ve never liked Achilles but the more times I read The Iliad and related material, the more I’ve come to appreciate the difficulties he faced. Do you act in the world and risk failure or the betrayal of everything you hold true? Or do you – in effect – keep your head down and hope the gods take no notice of you? (I can’t buy into the Bronze Age warrior ethic of Homer nor its modern equivalent but I can understand that fear of acting, and in that sense I have a deep sympathy for Achilles.) Even on a simple (hah!) personal level, acting is a terrifying thing: Do I quit my dead-end, boring job? Do I ask that person out? How far do I go to keep my aging cats healthy? Doing something – anything – leaves you open to its consequences. And it is that idea that has made The Iliad and now Ransom such interesting reads for me as a maturing reader. with no one there to protect him from chaos and ruin. to seeing his child, whom he loves dearly, come home. in the land of Troy, yet not one remains alive. were borne to me by other wives in my palace. Most of my sons have been killed in this wretched war. to beg you for his release. I have brought a large ransom. 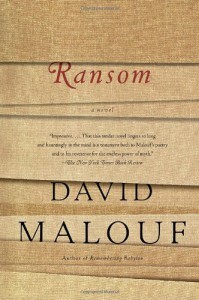 In Ransom, David Malouf has taken this all-too-brief moment of compassion in the midst of dreadful war and has expanded upon it to create a modern novel that explores the possibilities of ignoring Fate. The novel begins with Achilles brooding on the beach, reflecting on his life and his destiny. Malouf’s Achilles rages not at Agamemnon’s insult (though it’s the catalyst) but against his fate: “But in some other part of himself, the young man he is resists, and it is the buried rage of that resistance that drives him out each morning to tramp the shore” (p. 10). To add to his misery, he now feels guilt that Patroclus has died in his place and apart from him, and he feels trapped: “He is waiting for the break. For something to appear that will break the spell that is on him, the self-consuming rage that drives him and wastes his spirit in despair” (p. 35). That “break” soon appears in the guise of Priam, who conceives of an audacious plan to recover his son’s body. Audacious because it calls upon him to act as a simple man, not the king he has been nearly his entire life. Malouf’s Priam, like his children Cassandra and Helenus, is prone to inspirations from the gods, and one night he is visited by Iris – goddess of the rainbow and Zeus’ messenger – who whispers in his ear the blasphemous idea that the way things are is not how they must be in a world “that is also subject to chance” and gives him a vision of a night-time journey, accompanied only by one companion, to the Achaean camp. From the day he was born, except for one brief, traumatic moment, Priam has been ringed about by ritual, tradition and expectations based upon his sacred role as king. It’s a sterile life, cut off from any real contact with other humans – even in what should be the most intimate of relationships: husband/wife, father/children. But he senses the possibility in the act of approaching Achilles as a simple man, a father. The possibility to confound what Fate and the gods have in store for Troy, if only for a moment [the 12-day truce]. Similarly, when Achilles sees Priam in his tent, he realizes the possibilities the old man’s appearance opens up - though neither has the strength at the end to seize them. Which, for me, is the real tragedy of The Iliad and of this novel: We see the man Achilles might have become. An honor-bound warrior – yes; a god-like killing machine – yes; but also a man capable of empathy and compassion (a notion I don’t think entirely alien to Homer’s original). There’s a third character – Somax – the humble carter whose cart and mules are hired for the trip to the Achaean camp, and who – for that night – takes on the persona of Idaeus, the king’s herald. Somax is Priam’s gateway into the world of humanity; and their journey is Priam’s introduction to what he’s lost by being king. There are near-lyrical scenes where the old king marvels at cooling his feet in a river or learning how to make griddle-cakes (realizing for the first time that a real person makes them). The great Achilles, eyes aswarm, is weeping. With a cry he falls on one knee*, and leans out to clasp his father’s robe. Automedon and Alcimus, their swords now drawn and gleaming, leap to his side. The only reason I’m not giving this book five stars is a personal disagreement with how Malouf handles the gods. In the beginning, when Iris visits Priam in his bed-chamber, there’s an ambiguity about what the gods are. Are they real or are they products of mortal minds? Priam is alone. He’s prone to visions. Could Iris be his subconscious creating the only thing that could move him from his appointed role, the cage he’s constructed around himself – a god? That ambiguity is sacrificed when Somax and Priam meet the quite real figure of Hermes as they cross the Trojan plain. Unfortunately, in my view. I would have liked the author to retain that sense of ambiguity. That aside, I very strongly recommend this novel. And on a similar note: As you may have gathered, one of the principal reasons I thoroughly enjoyed reading (and rereading for this review) Ransom is the theme of denying the existence of Fate, and I was reminded of two tales that I would also recommend: The short story “Wolves Until the World Goes Down” by [a:Greg Van Eekhout|1957584|Greg Van Eekhout|http://d.gr-assets.com/authors/1305822447p2/1957584.jpg] (in [b:Starlight 3|612560|Starlight 3|Patrick Nielsen Hayden|http://d.gr-assets.com/books/1312059158s/612560.jpg|599016]) and [a:China Miéville|33918|China Miéville|http://d.gr-assets.com/authors/1243988363p2/33918.jpg]'s [b:Un Lun Dun|3494702|Un Lun Dun|China Miéville|http://d.gr-assets.com/books/1328018810s/3494702.jpg|2959401]. The former is a subversive tale about Ragnarök and breaking the chains of Fate. The latter begins as the usual tale of a chosen hero who will defeat the evil ruler but soon switches gears entirely to become a story about an entirely different hero who ignores the maunderings of hoary old Fate to make her own destiny. * Note the inversion of roles in Malouf’s version.